In this age, technology evolves and advances quicker than you can say, “Sound Level Meter”, but with these rapid advancements comes greater efficiency, more advanced features, simpler usability, quicker operation and revolutionary ways of improving previous processes and functions. This statement is equally as correct with Noise Technology. Epitomising all of these advancements is Castle Group Ltd’s brand new development, the dBAir Sound Level Meter. One of these game changing advancements is the addition of Wi-Fi, which sends all of your measurement data immediately from your hand to your Castle Cloud Software account. Get the most out of your measurements and never worry about data issues again, with large on-board memory and automatic data back-up in the Castle Cloud. Meaning storing, sharing and exporting data has never been easier. Built on a platform which utilises the latest in processor and display technology, the dBAir is fast, low-power and small, but with huge internal memory. 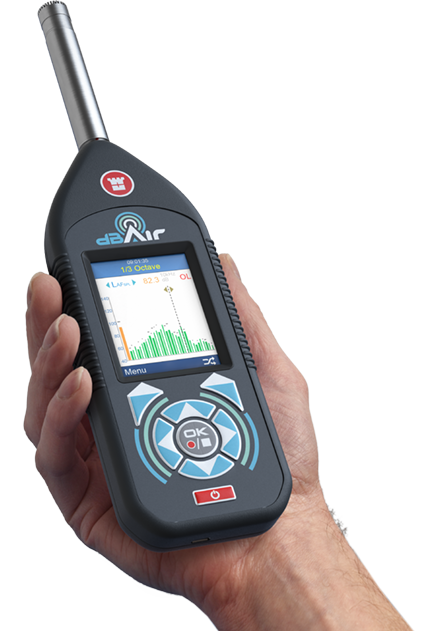 With vast capabilities across the whole spectrum of measuring sound, the dBAir has dedicated systems for Safety Managers and a whole host of different systems for Environmental Assessments. Whether you are looking to measure Construction Noise, Boundary Noise, BS4142:2014, Railway Noise, etc., the dBAir is the newest Noise Technology that’s high performing and low cost.